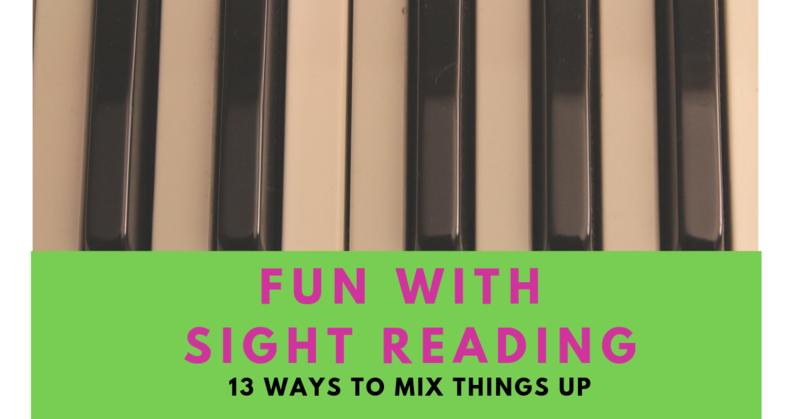 We need a toolbox of clever tricks to keep sight reading fresh and fun because there are no pictures or stories, yet each exercise needs to be played 3 times. Kids often want to play it just once and move on, but they will become much more confident readers with repetition. 3 is the magic number! Here’s my sightreading toolbox. Try them out and let me know what you think! (Note: I use Piano Safari sight reading cards, but these ideas could be adapted to work with any system/method). For example we mark the right hand ones red, the left hand ones blue and the rhythm ones any colour you like. They can also mark the ‘sames’, 3rds and rests with particular colours- kids love to colour their exercises. Just be consistent. Tip – friction ink pens are great for this, as if they get carried away and make errors you can just rub them out. 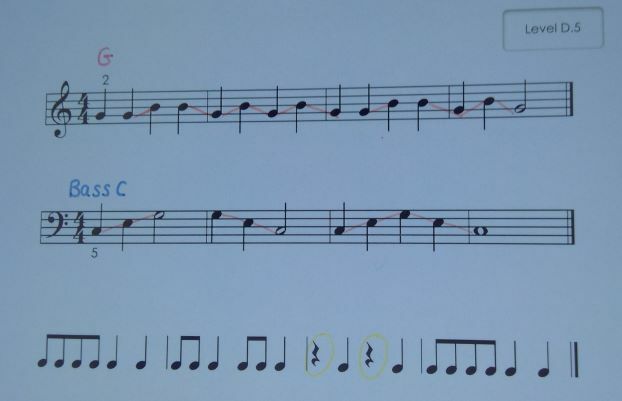 Sight reading card with RH start note in red, LH start note in blue, 3rds with orange lines and rests circled yellow. Let them ‘choose’ the order. 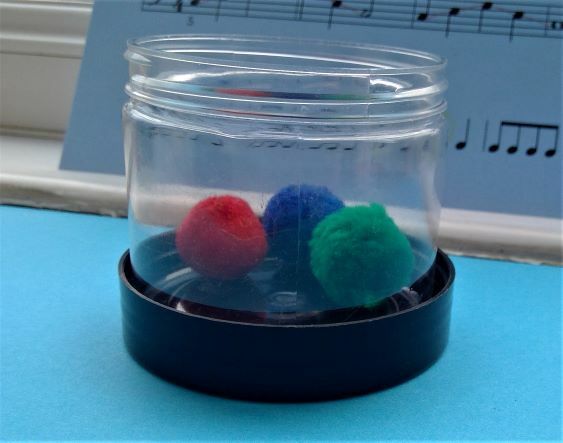 I have 3 pompoms in a little jar: red (for right hand exercise); blue (for left hand exercise) and green (for rhythm exercise) and pupils close their eyes and get one out to see what they will play first. They love the surprise! You could even ‘fish’ for them with little magnetic cards and a magnet fishing rod, to ramp up the fun factor! 3. Have them chart their own progress and reward milestones. My pupils all have a sight reading log chart. They enjoy crossing off each one, seeing their progress and getting closer to that sweetie that they will earn when they have completed all 16 cards in a unit. You could let them draw a star or smiley face for each repetition directly on the card too. Have a couple of exercises laid out and have them play one to you. You have to work out which they played. They will try hard to get it right! 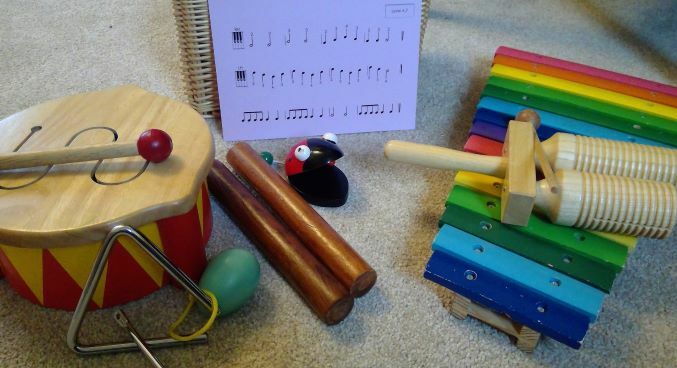 Swap over and have them listen and work out what you played (it might help if you say the animal rhythms, or ta-tis etc as you play). This is great for their listening skills and memory. Use different instruments or body percussion for the rhythm exercises, to mix it up. I use drums, triangles, claves, xylophones, castanets, shakers. You could use any household object e.g. pencils, wooden building blocks, pans, tubs etc. Together, you could assign a different animal rhythm to a different instrument so they quickly switch between them. It encourages them to look ahead and see rhythm in blocks and patterns. Alternate bars or assign one animal rhythm pattern each- this is fun for them and encourages good listening and following the music. They will enjoy doing it with you as a team. Encourage them to sing while they play. This could be the animal rhythm words, finger numbers, key names, or even solfa (do-re-mi etc). Later, see if they can stamp or walk the beat whilst tapping the rhythm. A real challenge! Play with a metronome ticking, or a backing track for the rhythm exercises. Do you have any ways that you make sightreading fun for your children or pupils? I’d love to hear more ideas to add to my toolbox!